Physiognomy are esoteric knowledge about proportions of a human face and laws of sacral geometry. The fourth page describes the sacred Egyptian triangle (ratio of sides 3:4:5) which is a basic geometrical figure in proportions of The Pyramid of Chephren, and a basic geometrical figure for well-known theorem of Pythagoras. And also the fourth page shows the sculptural image of the pharaoh Chephren which proportions are constructed according to the sacred Egyptian triangle that specifies the important value in physiognomy. Image of a human face in physiognomy. Laws of geometry in ancient Egypt. Sacred Egyptian triangle and proportions in the pyramid of Chephren. From a history of ancient Egypt it was not kept any written data on geometry, namely there are no books or texts in which geometrical knowledge are written, but there were architectural constructions of pyramids and temples, and also there were images in which knowledge on geometry of ancient Egypt are displayed. Attentive research of Egyptian images allows to understand geometry and including allows to understand geometrical proportions of a human face and body that is necessary for understanding of a human essence from the point of view of physiognomy. For example, the sculptural image of facial profile of the pharaoh Chephren. Two charts show the sculptural image of the pharaoh Chephren, but charts differ as are compared to the physiognomic scale of measurements differently. In the left chart the image of the pharaoh Chephren is correlated to verticals of the square of feelings, namely the side of the square is correlated to the most expressed points of eyebrows and chin, and consequently the image has inclined position. In the right chart the image of the pharaoh Chephren has position which is fixed in the sculpture, and consequently verticals of the square of feelings correspond with the expressed point of eyebrows but do not correspond with the expressed point of a chin. It is the common feature of sculptures and other images in which the physiognomic sphere of feelings is inclined from a vertical. It is possible to assume that sculptors of ancient Egypt have inclined physiognomic sphere of feelings from a vertical to bring to a focus to relevancy of feelings. Or it is possible to assume that notion about proportions of a human face in ancient Egypt corresponded to type of a skull and has been caused by racial features of people, if to consider concepts of modern anthropology in which anthropologists distinguish the European and African types of skulls, that is shown on the following chart. This chart shows exaggerated images in which distinctions of European and African types are exaggerated. Actually among Europeans and Africans it is possible to see skulls of both types. The African type of a skull is more often characteristic of female facial appearance and the European type of a skull is characteristic of male facial appearance. The African type of a skull below has more expressed lips in comparison with the European type above, if to apply to the analysis of images the physiognomic scale of measurements which are offered on pages of this site, and consequently the Egyptian sculptors have made the sculptural image of pharaoh Chephren with the inclination of sensual sphere from a vertical that the sculpture correspond with the African type. Or the Egyptian sculptors have not considered correct vertical position of the represented face, and consequently in the sculpture of pharaoh Chephren have fixed position according to which verticals of the square of feelings are deflected and do not correspond with the expressed point of a chin. Anyhow, but by comparison of a face to the physiognomic scale of measurements in the images of pharaoh Chephren it is possible to see geometrical laws which are caused by proportional ratios of physiognomic spheres and proportions of the sacred Egyptian triangle which in both cases determines proportions of the shown sculpture. In the right chart the distance from top of a head up to the top edge of an ear has size of 60 zens and the distance from the bottom edge of an ear up to a chin has size of 60 zens. And also the size of an ear is 60 zens, namely the ear position coincides with correct parameters of physiognomic spheres that is criterion of correct proportions of a human face in a context of physiognomy. In the left chart the image of pharaoh Chephren is correlated with the correct vertical of the physiognomic scale of measurements, and as a result sizes of spherea are following: consciousness has 66 zens, individuality has 56 zens, sensuality has 58 zens, and thus position of the ear does not coincide with borders of physiognomic spheres. But in the left chart the geometrical figuree JEI has ratio of sides 3:4:5 that is the sacred Egyptian triangle. 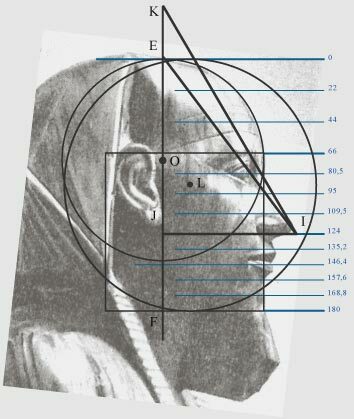 Namely if to draw the line from point I (tip of a nose) to point E (contact of the circle of consciousness with the line of top of a head) then triangle JEI is sacred Egyptian, though physiognomic spheres have wrong proportional ratios. And in the right chart the sacred Egyptian triangles (red color) have wrong configurations though coincide with the top of a head and the tip of a nose. It testifies to not casual proportions which are fixed in the sculpture of pharaoh Chephren, and also allows to assume that the sculptural image and the pyramid of Chephren are constructed according to the uniform geometrical principle which is included in proportions of the sacred Egyptian triangle. In particular the angle of inclination of lateral sides of the Chephren's pyramid approximately is 53 degrees, and also the angle of triangle JEI in point I approximately is 53 degrees in the sculptural image of pharaoh Chephren. And also there are some other surprising geometrical concurrences according to which it is possible to assume that the shown sculpture has been calculated according to geometrical principles which correspond with geometry of the Chephren's pyramid and which are included in the sacred Egyptian triangle. Probably, in ancient Egypt there was a special method for calculations of proportions in a human face. Namely sculptors of ancient Egypt drew the circle which was tangent to the tip of a nose and top of a head, then ancient sculptors entered the sacred triangle with ratio of sides 3:4:5 in the circle, and then Egyptians calculated necessary proportions of a human face as a result of rotation of the sacred triangle in the circle, that is shown on the following chart. Red triangles X1Y1Z1 - X2Y2Z2 - X3Y3Z3 correspond to sacred Egyptian or Pythagorean proportions. Three triangles are identical and constructed as a result of rotation within the framework of the circle which is tangent to the nose-tip and top of a head. Lines X1Y1 - X2Y2 - Y3Z3 determine position of the eye. Line X2Y2 determines edges of lips, and also pay attention that line X2Y2 is parallel to the line which is tangent to the expressed points of chin and eyebrows. Except for the shown lines as a result of rotation of the sacred Egyptian triangle in the circle it is possible to find many other physiognomic parameters, namely for calculation of required proportions of a human face it is possible to make more complex drawing. And also it is possible to compare the face of this or that person to geometrical lines of the shown sacred triangles, then it is possible to do conclusions about proportional harmony or disharmony of facial features. In essence the shown chart is a method of calculations which could applied in ancient Egypt to calculations of proportions of a human face, but which differs from the method of calculations by means of the physiognomic scale of measurements which are offered on pages of this web site. Two methods in view of physiognomy yield identical results, but the method of calculations by means of the physiognomic scale is convenient for psychological characteristics which can be carried out according to the calculated proportional ratios and according to geometrical figures which designate physiognomic spheres and levels of a human face. And the ancient Egyptian method is interesting from the point of view of esoteric senses which are included in geometrical proportions of the sacred Egyptian triangle, as the system of geometry of ancient Egypt is original display of sacral geometry of the universe. 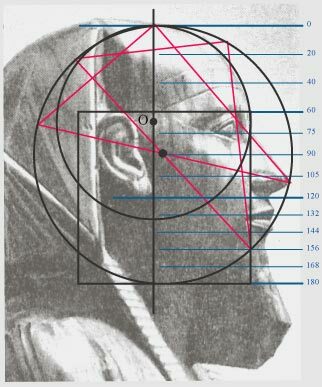 And accordingly the sight at proportions of a human face from the point of view of ancient Egyptian geometry is interesting to understanding of geometrical laws which explain principles of sacral beauty and harmony. 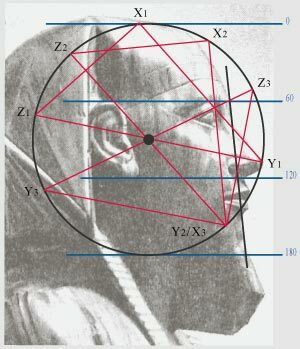 The shown ancient Egyptian method for calculations of proportions of a human face by means of sacred triangles is a hypothesis, as actually sculptors and architects of ancient Egypt could used any other methods of calculations, but anyhow imposing of sacred triangles on profile of a human face, and in particular on the sculptural image of pharaoh Chephren specifies possible existence of this method. The following page gives the description of harmonious proportions in lines of geometrical figures according to which in a context of physiognomy it is possible to calculate harmony and beauty in faces of people.